Norm Van Lier - like I said above, Norm had the best career in the number 2. He averaged 12ish points a game for Chicago and was named to one of the All-Defensive teams in all 8 seasons he played in the Windy City. 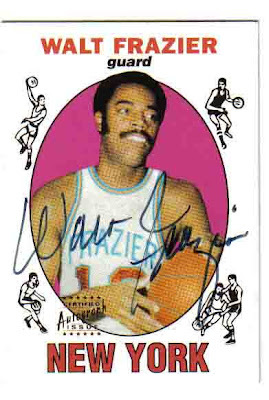 Van Lieezy was even named All-NBA second team in 73-74. 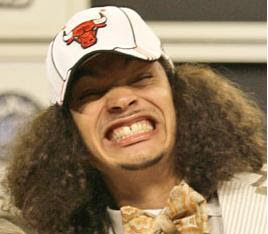 However, if you ask any Bulls fan born after 1975 they'll know him as the commenter for the local Fox Sports channel. But all in all, not a bad start for the first guy to ever wear the deuce. Brad Sellers - as a seven-footer in the 80's, Brad Sellers averaged 10 ppg and a whopping 3 rebounds a game. 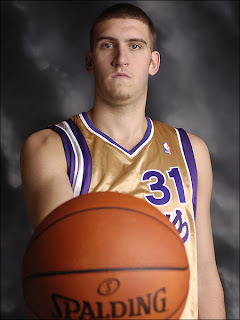 He was drafted ahead of Scott Skiles, Arvydas Sabonis, Mark Price, Dennis Rodman, and Drazen Petrovic. 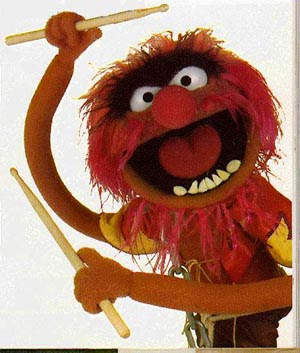 Otherwise though, he was pretty stellar. Rory Sparrow - he played 59 games for the Bulls in parts of 2 seasons. His name is Rory Sparrow. Next. Dennis Hopson - averaged all of 4 points in 10 minutes a game for los Toros in the 90-91 season. But being part of that team means he's got more titles than Karl Malone, Charles Barkley, Patrick Ewing, John Stockton, and Reggie Miller combined. Advantage? Dennis Hopson. 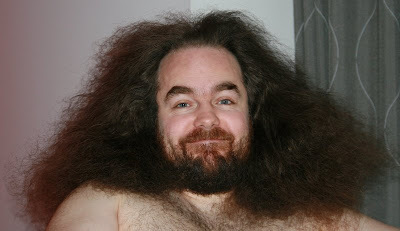 Mark Bryant - my friend Bonesaw's dad hated Mark Bryant with the intensity of 1,000 burning suns. I don't know why he didn't like a guy who had the worst hands of any basketball player in existence not named Kwame Brown and who made 2.05 million dollars for 45 games. I don't really know why that wouldn't interest him. He went on to destroy the basketball souls of six more teams the next three seasons before having the decency to be forced out of the league. Khalid El-Amin - don't get it twisted, I was a fan of Khalid in college, but once he couldn't wear that undershirt everyone realized that he was really fat for a guard. Not Baron Davis chunky or Deron Williams stocky, but straight up fat. He played a grand total of one season in the league. Of course that one season was spent as a spot starter for the Bulls. Excellent talent evaluation Krause. Eddy Curry - sure, you'll say that Eddy Curry is one of the top 10 centers in the NBA right now. You'll argue that with him and Zach Randolph, the Knicks could challenge for a playoff spot this year. You might say that he averages almost 20 points a game. And while these things are true, I'll casually remind you that Eddy Curry has a medically documented HOLE IN HIS HEART. Not a joking, ha-ha-he-doesn't-try-hard hole, a literal hole that is in his heart. Not good. So that's the history of the number 2 in Chicago. Luckily, a new hope dwells. The rapping, self-ooping, NBA 2K7 dominating Thabo Patrick (?) Sefolosha is sporting the numero dos now. Here's hoping that not only does he not contribute to the dismal history of this beautiful number, but that he makes it somewhat respectable. But at the very least, my high school number seems to be in good hands. "Van Lier says he put a curse on the number because they retired Sloan's number and not his. Seriously. 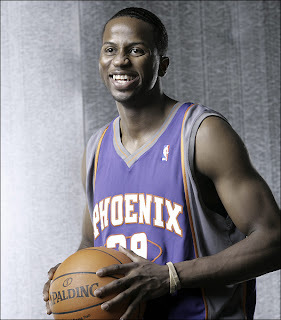 Randy Brown was set to wear the number during 1996-97, after the Bulls signed Robert Parish, and Van Lier talked him out of it. Brown wore "0" the year before, but was told a team couldn't have "00" and "0" by the NBA. He then went for "2", but Van Lier talked himout of it. Brown actually played a couple (crappy) preseason games in the number. Ron Harper's worst season as a Bull (94-95) was in number 2 as well. He changed to 9 the year after." Of course KD would solve the mystery. Every few seasons there is an NBA team that I'm drawn to beyond any explanation. 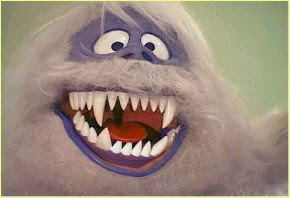 This year, it appears to be the Grizzlies for whatever reason. However, back in my sophomore year of high school I was obsessed with the New Jersey Nets. Never mind the fact that I was a Bulls fan living in Illinois during the last year of the Jordan Dynasty; forces unknown to me pushed me to follow the exploits of an average east coast team for the better part of 2 years. It took me 15 minutes of intense Googling and address modification to even recover this absolutely ridiculous Slam magazine cover, and with good reason. If you were the editors of Slam, would you want to prominently display the fact that you predicted the Nets would win a title by 2001? Looking back, that roster was an absolute disaster. I'm not even sure who you could call the centerpiece. Van Horn was the #2 pick, but he wasn't ready then (or ever, as we would learn) to be a go-to guy. Sam Cassell was a winner back then too, but you couldn't really consider him a first option. Kittles, JaYson Williams, and Kendall Gill were all guys who would have been fantastic bench players. But then you look at the stats and see that 6 guys averaged double figures and it isn't that crazy that a high school kid could love this team. 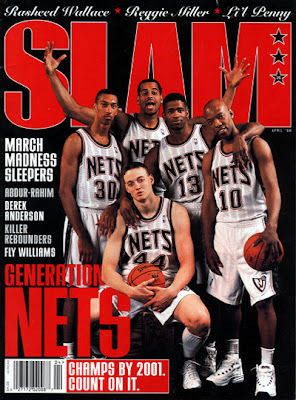 When I really examine it, I guess the main reason that I was attracted to the Nets was that they were very different from most other teams stylistically. Kittles wore one sock up at Villanova, which was just about the coolest thing a kid from the far, far south suburbs could imagine. 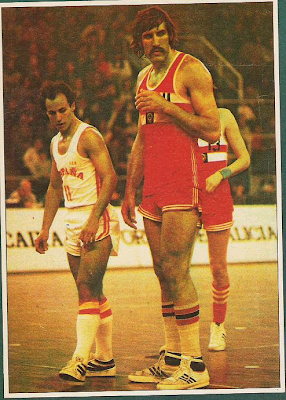 Van Horn was the benchmark for moderately athletic big men like myself. 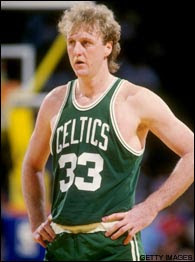 A smooth, mobile, white guy who could pass and score; he is/was the NBA player I liken myself to the most. And then you had characters like Chris Gatling, Sherman Douglas, and Luscious Harris off the bench, filling in the sketch of a 14 year old's basketball dream. Finally finding that picture really helped me understand just what I enjoy about the NBA. Yes, the Bulls titles were mind-blowing, but back then you knew the post-MJ years would be a tundra. Needing something to fall back on, entertainment hooked me. 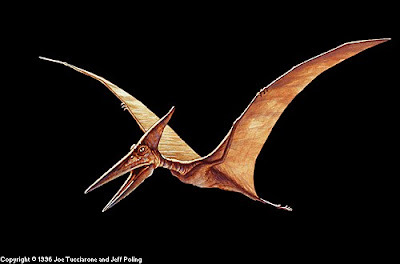 The Nets were never great, and they never would be. But for those 2 years, they were a team I admired from afar and appreciated any way I could. They ran, they scored, they didn't play much defense, and they were fun. When you're trying to find something to keep you interested, there isn't anything better to ask for than that. Plus they were awesome in NBA Live '97. Labels: history, the Nets, what was I thinking? 1. "The Big Smooth" is one of the best nicknames in the history of basketball. 3. One time, he tried to wear a bandanna during the game. This article doesn't mention it, but if I remember right, he got away with it for a half. 4. Hosts "Big Smooth's Coolout" which raises money for pediatric AIDS. This really is awesome. 5. Was a part of the picture below, which may very well be the best photograph ever captured. By all accounts, Andrei Kirilenko has been ridiculous this summer. 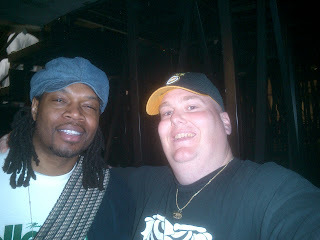 I've been a huge AK supporter ever since I saw him throw one of my favorite passes ever in a summer league game. Driving from the right wing, Kirilenko reached the block and threw some kind of two hand, over the head pass to a guy driving the lane behind him. That's a terrible description, but seeing it was awesome. 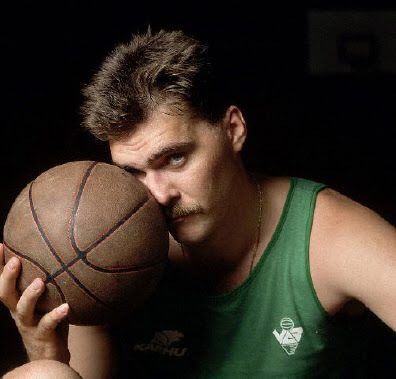 Anyways, AK47 lit up Lithuania in the Eurobasket finals and now I'm pumped for him to do something on the Jazz. Kirilenko is one of those once-in-a-lifetime players. Not in the Jordan, Bird, Magic way but in more of a Barkley, Manute Bol, Khalid El-Amin kind of way. 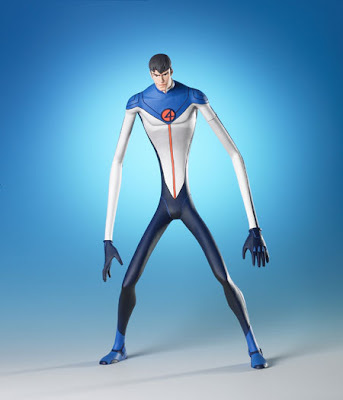 By my very scientific calculations, he has the longest arms in the history of guys who aren't seven feet tall. Those Inspector Gadgets allow him to block an insane amount of shots and get his hands on a ton of steals. And given space, he can be a reliable scorer. Not to mention that he looks like Ivan Drago. Kirilenko's the type of player who you don't want to see put on muscle because so much of his effectiveness comes from his arms' ability to be in six places at once. 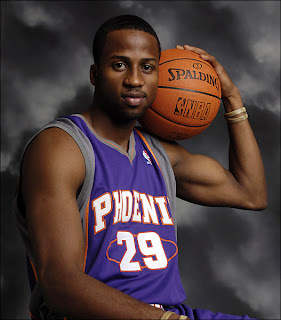 Word was, he was nearly traded to the Suns for Shawn Marion. Sadly, this trade didn't go down as it would have been the most perfect situation in the league for him. 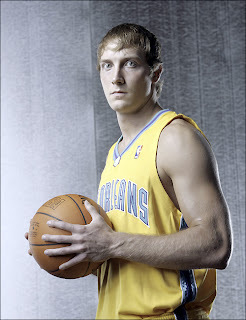 Rather than having to play out of position as a power forward, when Kirilenko is given a chance to create, he's deadly. I don't know if it's because of his angular body, but he seems to have a knack for exploiting strange angles to the basket. 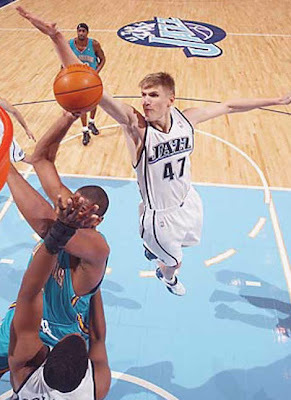 Nonetheless, Kirilenko is a Jazzster again this year. That means he'll probably be stuck shooting jumpers on kickouts from Chesthairlos Boozer in a tremendous waste of his unique skill set. But keep your eye on the stat sheet because he's sure to bust out something like an 18/14/6 with 9 blocks and 3 steals. 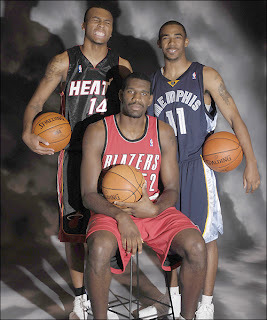 Greg Oden being out for the season really puts a damper on this whole rookie extravaganza I was expecting. However, as Ziller says, the Blazers may be in an even better situation next year. And while it's totally depressing that Gode has to miss this season, Portland's future is still crazy illuminated. Nonetheless, it's curious that Oden's knee would get so bad so quickly. Here's what we know - the Blazers put Oden through a battery of medical tests before the draft. According to the most recent reports, his knee was "pristine." However, I have a hard time believing that Oden hurt his knee so severely that he would need surgery just from getting off his couch. I would surmise that there must have been some sort of underlying problem with his knee (and I'm not the only one), and either the Blazers team didn't catch it or they thought it wasn't serious enough to worry about. Or perhaps there was something more sinister to this. I haven't even convinced myself that this is within the realm of feasibility, but I think there is some sliver of reality that the Blazers could have known that there was a chance this could happen. Think of it this way; the Blazers knew that adding Oden would not immediately vault them in to upper echelon status. And though it's an amazing stretch of the imagination to even contemplate this, couldn't the Blazers have possibly taken Oden with the knowledge that he could miss this year, therefore ensuring that they would have another high draft pick next year? Thinking back, the acquisition of Channing Frye was suspicious. Portland gave up their best player (Zach Randolph) in return for a guy who would theoretically be backing up Oden and LaMarcus Aldridge. This is not a valuable trade for Portland, except that they rid themselves of Randolph's chemistry destroying ways. 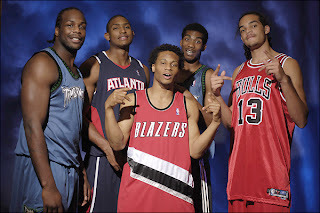 Therefore there is no one to challenge Brandon Roy's alpha dog status. The team gets a year to learn each other, then next year they add Oden and another top 5 pick? To me , that sounds like a terrific growth plan. Yes, this theory is just this side of ludicrous and way past the line of risky. I'm sure I'll regret typing it in the morning, but just the thought that maybe, possibly, somehow the Blazers knew what they were getting in to really intrigues me. If this doesn't destroy Portland, this could end up beautifully for the Blazers. And if this ever ends up being the case I take my hat off to Kevin Pritchard. 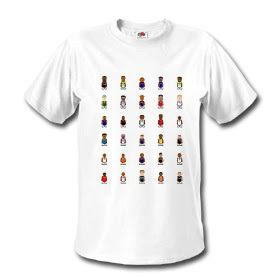 My fascination with the incoming rookie class is quite obvious (BUY THE SHIRT). 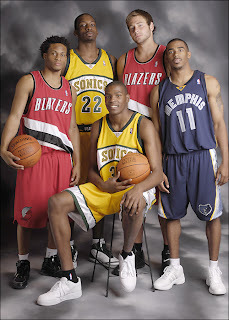 But this being the most hyped draft class ever justifies that in my mind. Ergo, El Blowtorch's onslaught of first year delights continues. Let's examine some of the more awesome pictures from this year's rookie photo shoot. You can tell the guys that have no chance of winning the Rookie of the Year easily. They don't even get numbers for the photo shoot. Somewhere, Lee Humphrey cries himself to sleep clutching his Rick Mount shooting tapes. Grandpa's unfortunate flatulence was a source of much embarrassment to the children he helped raise. Gay marriage: now legal in both Memphis and Portland. 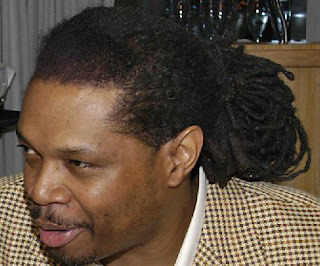 Were this 1994 and that basketball a boombox, Alando Tucker would still be horribly outdated. Spencer Hawes, perfecting his waiting technique that will come in handy in a couple of years. 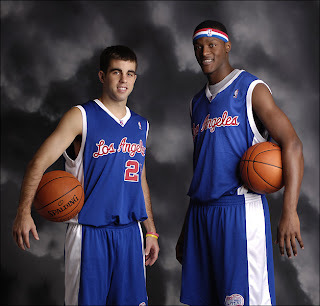 These two Clippers are named Al and Jared, but I bet you wouldn't be able to guess which is which. Clearly the grey backdrop drives the rookies CRAZY. 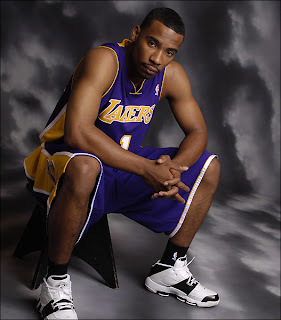 The photographer quickly learned never to interrupt Javaris Crittenton's bathroom breaks again. 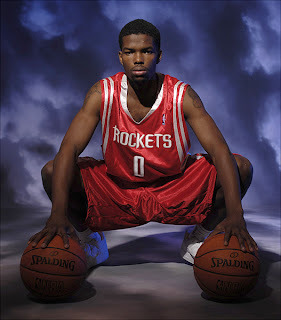 Aaron Brooks is frighteningly frog-like. I predict you shoot 28% from the field. I have no idea what the thought process behind this photo was. None of these guys played together. Nor were they all the same class in school. Nor did they all face each other in the championship. Nor did they end up on the same team. 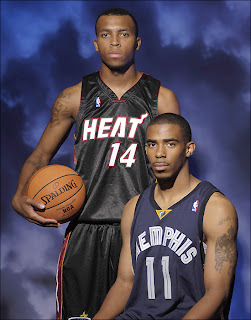 I'd imagine the photographer just needed Conley and McRoberts to fill out the shot, but your guess is as good as mine. Kanye's Graduation dropped today, and it really got me thinking about how closely his career thus far has mirrored that of LeBron James. That's not to say that LeBron is basketball's Kanye or vice versa, but the similarities between these two are straight-up eerie. Let's start where all good stories should -- at the beginning. 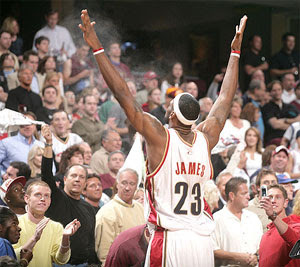 LeBron James entered the League as the most hyped high schooler in my lifetime. The hoopla surrounding his debut was incalculable. Dude was on the cover of Sports Illustrated as a junior. And when the Cavs did terrible enough to secure his services, James was the first pick of the draft and went in to his rookie year as the prohibitive favorite to take home the ROY trophy; which he did after an impressive debut. 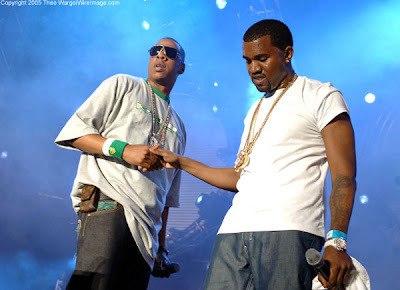 Compare that to the debut of Kanye West; after 3 years as a Jay-A apprentice, West released The College Dropout to deafening critical acclaim and commercial success. In time, the record would reach #2 on Billboard's Top 200 and #1 on the Hip-Hop and R&B charts. When trophy time in the music world came around, Kanye took home Grammys for Best Rap Album and Best Rap Song. Standing on the cusp of greatness, both LeBron and Kanye sought to make their most important strides in their young careers. No matter what glory Late Registration received at the time, in retrospect, it pales in comparison to The College Dropout. Whether it was lyrical complacency, forced introspection, or attempting to live up to his own hype, Kanye West's sophomore effort falters where his debut was so strong. 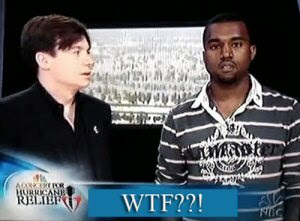 As has been well documented, Kanye became irritatingly brash, declaring for anyone who would listen that he was going to change rap forever. And though Late Registration debuted at #1, the extravagant orchestration, bizarre instrumentation, and more inward-looking lyrical approach now feels like listening to a man try to prove how great he thinks he is. West would go on to win the Grammy for Best Rap Album again, but his boasting left many people sour. At this same time, LeBron James was taking home some serious hardware as well. Following his second and third seasons, LeBron was named to the 2nd and 1st All-NBA teams respectively. However, the Cavaliers failed to make the playoffs in the 04-05 season then lost in the Eastern Conference Semifinals in 05-06. 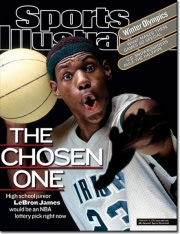 It was around this time that LeBron began stating that he sought to be a global icon. Unfortunately, it was also in this time frame that many people began to question his ability to win a game in crunch time. Though both statements are hyperbolically overstated, LeBron's reputation took a bit of a hit. So here we are. As these two stories have traveled down parallel roads of redemption we come to present times and the most recent (and important) contributions that these two saviors have made. Kanye West's Graduation is stunning in its restraint. That's not to say that this record isn't totally indulgent because it is. It's also not perfect as a whole but parts certainly are. Rather than continue to expand on his old soul style, Kanye has turned to Europe and fashioned himself as some kind of hybrid Dilla/Timbaland. Stringing together his trademark samples with icy, squelchy synthesizers West has improved upon his original modus operandi to the point that his new steez is wholly unique and untouchable. And though his losing the much ballyhooed showdown with Fitty would further entwine he and LeBron's careers, it won't happen. Much like Kanyeezy, LeBron's last performance was his greatest accomplishment to date. His insane Game 5 explosion is the kind of thing we've been needing to appoint LeBron as the True Savior of the game we love. Though he was betrayed by less than stellar teammates in the Finals, the playoff manifesto that LeBron birthed is exactly what was expected of him. For the first time in his career, the true capabilities of this typhoon of basketball talent showed its terrifying force. Both careers short but filled with eons of meaning. Two men simultaneously where they should be and nowhere near what they can become. The stories of LeBron James and Kanye West are quite incomplete, but it feels good to be able to experience something important. In the years to come, there is nothing but hope that these cats become exactly what they expect from themselves. 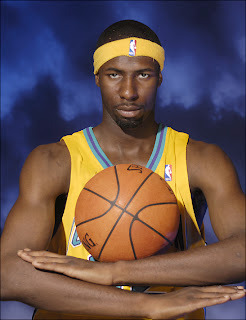 I know what you’re thinking, of all the players in the NBA, why do you think Richard Hamilton would be a good ninja? Well if you’d let me finish my thoughts I would tell you, so settle down for a minute. Geez. There are quite a few reasons why Richard Hamilton would succeed as a ninja, just as he did as a shooting guard for the Detroit Pistons. First and foremost is his sneakiness. Tell me the way that he creeps around screens and darts in and out of traffic isn’t like every ninja you’ve ever seen. What’s that? You haven’t seen any ninjas? Well neither have I actually; but when they’re in the movies they’re really agile and can dodge anything. I also would imagine ninjas to have a pretty solid mid-range jumper. They seem like the kind of guys that would practice that kind of stuff. Next is the fact that “Rip” (a fantastic ninja pseudonym, by the way) is tireless. He runs around for 36 minutes a night and never gets tired. All of my movie ninja experience tells me that you need great endurance as a ninja. Think about it. Ninjas can fight off like 96 guys in 12 minutes (8 gpm!) and not even break a sweat. And even if they did sweat, they’d have those sweet headstrap things to absorb it. Ninjas gotta stay cool. Here’s another ninja-y thing that Richard Hamilton is good at - he wears a mask a lot. Sure some ninjas probably don’t wear masks, but it’s highly likely that all the good ones do. It really helps their sneakiness and ability to blend in with their surroundings. As anyone who has seen the Pistons play the last couple of years, Hamilton wears the Schnozeroo at all times. Ostensibly, this is for protection, but in reality, it’s Rip’s way of calling out to his ninja brethren. Don’t get me wrong, I’m not saying that Richard Hamilton is currently a ninja. But if you think that ninjas don’t notice when a guy wears a mask and a headband at all times, you’re kidding yourself. Lastly, it is a widely known fact that ninjas always give of themselves for the greater good. They pretty much only do things that will help save lives. The same could be said for Hamilton’s role on the Pistons. Sure he could average more points if he wanted to, but he knows that he’ll give the Pistons a better chance of winning if he sacrifices some of his own glory for the team’s ultimate success. Very ninjaesque. With all the facts laid out there, it’s pretty obvious that Richard Hamilton is tops on the list of NBA players who could be ninjas (followed by Caron Butler and Marcus Camby). Honestly, I wouldn’t be surprised if he has already taken some classes towards ninja status, which would explain why he wears the mask. I’m seriously convinced that if Rip decided to abandon a life of jump shots and layups he’d be among the best ninjas in history. And if you don’t believe me, I’d watch your back because it’s very likely that a ninja is planning a retaliatory attack. I was a part of a roundtable discussion over at Halfcourt Heave (not a high percentage shot). It's pretty entertaining, so go give it a looksy. And yes, we actually did all gather around a perfectly circular table and discuss these topics one by one with no interruptions. Without further ado, I present to you the long hyped t-shirt based on the Blowtorch's rookie previews. All kinds of sizes, styles, and fits available at the Blowtorch shop so go pick one up RIGHT NOW HOLMES. Update: see the full size image right here. A few weeks back I got the idea to look at NBA teams in a historical context. Being a science major and professional researcher guy, I figured I was as qualified as anyone. Basing my study around 4 variables (NBA championships, all-time winning percentage, Hall of Famers, and years in the NBA) I figured I’d be able to cobble together some results that would support a few theories that I’ve assumed true since I started truly caring about the NBA. Hypothesis 1: the 5 most historically successful teams in NBA history are the Boston Celtics, Los Angeles Lakers, New York Knicks, Chicago Bulls and Philadelphia 76ers. Hypothesis 2: the next tier of historically successful teams is some mix of the Houston Rockets, Phoenix Suns, Seattle Supersonics, Detroit Pistons, and Portland Trailblazers. With these as my baseline assumptions, I set about devising what I felt would be the best way to define historical greatness. The blue portion of that delicious pie represents how many NBA championships a team has won in its history. Since this is the ultimate goal of every franchise, it was given significant weight (50%) in calculating the total score of a team’s score. The red portion of the chart shows the percentage (37.5) given to a team’s winning percentage throughout their history. In order for a team to be considered consistently great, they must be a consistently winning team and over time their winning percentage will show that. Last is the orange slice, which depicts how many Hall of Famers have played for a franchise. This can be a little misleading, however. 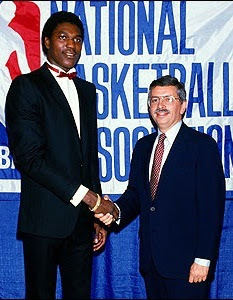 For instance, Dominique Wilkins is a HOFer based on his Atlanta Hawks exploits, but he did play that one season for the Spurs so he counts for them as well. Because of the nature of this variable, HOFers is only given 12.5% of a team’s total score. 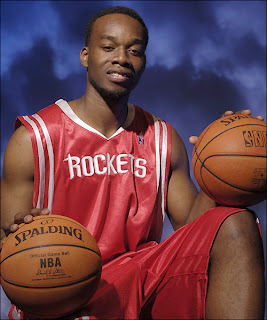 In the end it all evens out because Robert Parrish played on pretty much every team since the beginning of basketball. After adding these different variables together, the team’s total score was multiplied by the percentage of league history that that team has been a part of. Two examples: the Sacramento Kings have played in every NBA season (this will be number 58) and therefore have their total score multiplied by 1, whereas the Minnesota Timberwolves have only played 18 seasons (31% of all seasons) and have their total score multiplied by .31 to determine their cumulative score. All data can be found on these two Google spreadsheets. Due to this huge advantage in titles won, Boston and the Lakers will have solidified the top 2 spots in our historical rankings. However, there were still some interesting findings. I was surprised to discover that Golden State had as many championships as the Knicks. And once again, my eyes were opened to the true greatness of Tim Duncan. Here is where I felt a little bit educated, as I “picked” 8 out of the 10 most winning franchises in the league’s history. However, I was definitely taken aback by how consistently good the Suns have been, while never getting over the hump. And it was also a tad surprising that the Bucks and Jazz have been so good for so long. Once again the Celtics and Lakers are tops, but as we move down the list there are some eye-openers. I would have never guessed the Hawks to have fielded so many Hall of Fame caliber players or for the Kings to have so many either. But as stated before, a guy only had to play one game to get counted as a HOFer for a franchise; ergo, the low weight of this variable. Being a relatively new franchise hurt the Spurs, as they dropped out of the top 10 when compared over the span of the league. And helped along by their inclusion as an original NBA team, the Kings make a surprising re-entry in to the realm of historical importance. When people talk about the Celtics and Lakers being the cornerstone franchises of the NBA they are totally correct. In basically every statistical measure they rank at the top and they have been a part of the league since its inception. However, I (and I would assume many others my age) was unaware of how truly great the Warriors and Hawks are. Since I’ve followed the NBA, both of these teams have been mostly irrelevant, but the data shows that they are among the most important teams over the course of time. Unfortunately, this only exacerbates the frustration that fans must feel while watching their team be run in to the ground. Nonetheless, it never hurts to understand just where a team has been. In some ways, it can be the best way of knowing what the future holds.